A natural and hypoallergenic SPF 30 sunscreen from Jason. This chemical and fragrance free formula is mineral based and provides UVA/UVB protection from the sun’s harmful rays. It is easy to rub in and won’t leave a white film on skin like most mineral sun screens. As the sunscreen contains natural ingredients it is perfect for sensitive skin. Hypoallergenic, For Very Sensitive Skin & UVA/UVB Protection. Directions for use: Apply sunscreen liberally to all exposed skin area 15-20 minutes before sun exposure. Reapply as needed or after towel drying, swimming or sweating. Children under 6 months, ask a doctor. Aqua (Water), Caprylic/Capric Triglyceride, Dimethicone, Ethylhexyl Palmitate, Sorbitan Sesquioleate, Glycerin, Glyceryl Isostearate, Butyrospermum Parkii (Shea Butter), Helianthus Annuus (Sunflower) Seed Oil*, Simmondsia Chinensis (Jojoba) Seed Oil*, Polyglyceryl-3 Ricinoleate, Vitis Vinifera (Grape) Seed Oil, Aloe Barbadensis Leaf Juice*, Calendula Officinalis Flower Extract*, Camellia Sinensis Leaf Extract Magnesium Sulfate, Silica, Sodium, Chloride, Tocopheryl Acetate, Benzyl Alcohol, Phenoxyethanol, Polydroxystearic Acid *Certified Organic Ingredient. 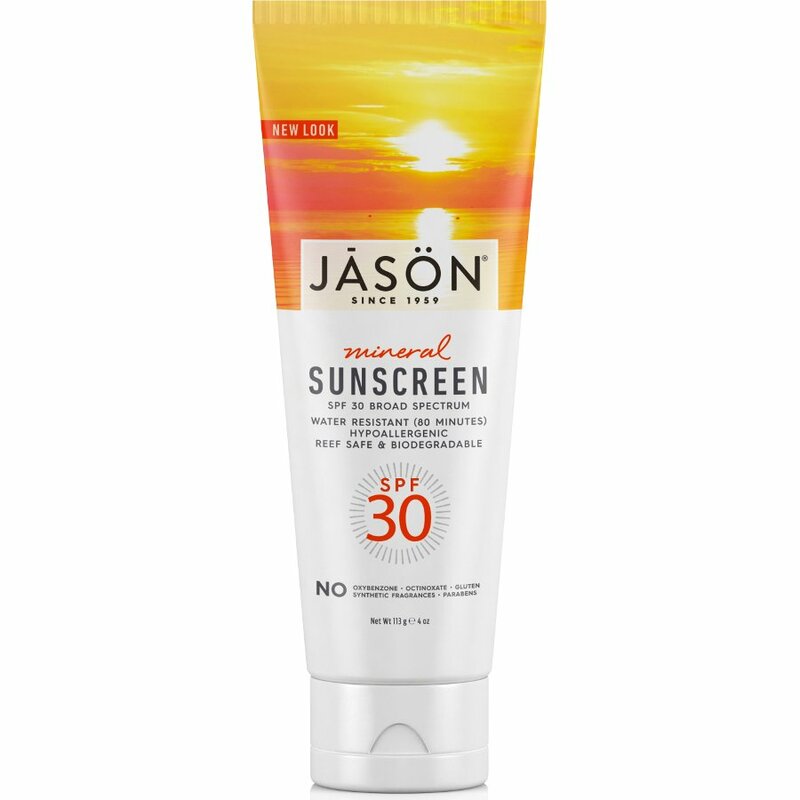 There are currently no questions to display about Jason Water Resistant Mineral Sunscreen SPF30 - 113g.